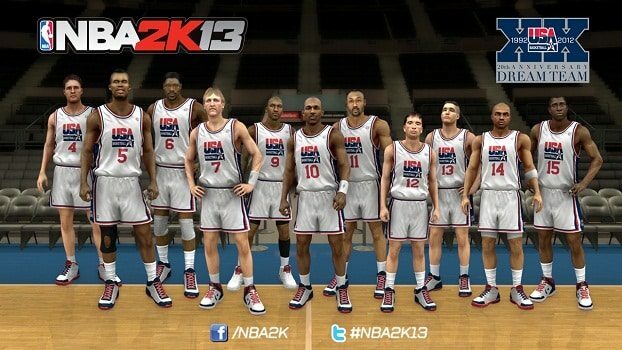 2K Sports have announced a partnership with USA Basketball, that will see the 2012 USA Basketball Men’s National Team and the 1992 “Dream Team” in NBA 2K13. Having earned recognition as one of USA Basketball’s all-time greatest teams, the 2012 USA Basketball Men’s Nation Team was lead to success by NBA 2K13 cover athlete Kevin Durant to numerous successful showings. Alongside this, the original “Dream Team” has long been considered the most dominant ever assembled, featuring eleven Hall of Fame players that include Michael Jordan, Magic Johnson, Clyde Drexler, Karl Malone, Chris Mullin, David Robinson and Charles Barkley. NBA 2K13 will release for Wii across North America on October 2nd, with an international release on October 5th. A Wii U version will follow later in the year.